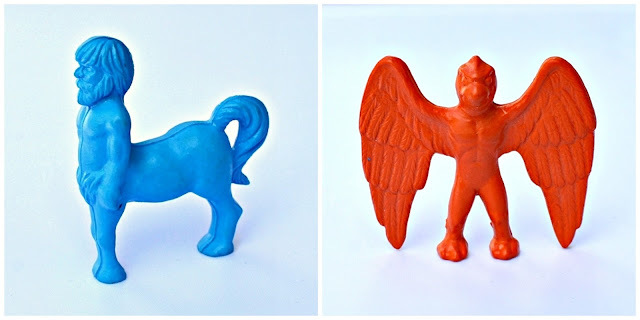 Shortly after I started this site I posted about Diener Mythological Creatures, a set of figures that was released by the Diener company around the same time as or shortly after Diener Space Creatures in the early 1980s, but not as well known as those. While the Space Creatures were based on weirdos from old sci-fi properties, these were focused on "real" monsters pulled from mythology and folklore--sort of like a modest precursor to Monster in My Pocket. Because I took nicer photos since that first post as well as the fact that I have a weakness for Diener figures, I thought I'd revisit the line in more detail. 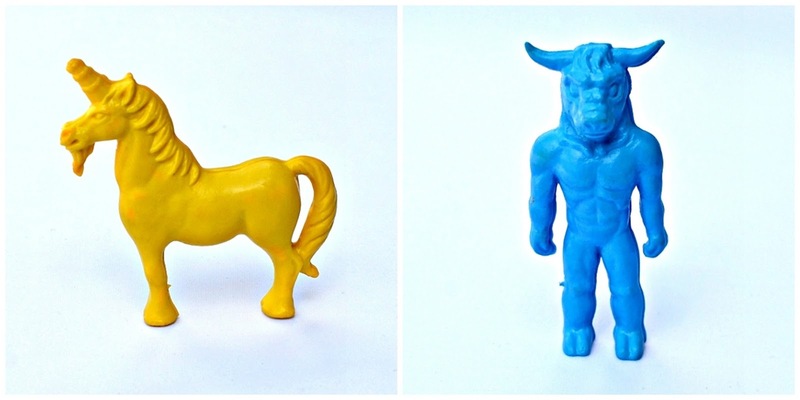 Centaur: Not the most exciting sculpt, but a man-horse is a man-horse, I guess. Somehow they managed to make this figure look almost 2D instead of 3D, with his arms sculpted as being straight down at his sides, and both sets of legs straight together. Garuda: It's kind of strange that they decided to make a Garuda/birdman for this set, considering there were only six figures and there are many more commonly-referenced mythical creatures that would have been more likely candidates for inclusion. But a birdman was also included in the Dragons N Monsters line of the same era, so maybe they were all the rage in the early '80s, or something. Like the centaur, this is a pretty simple sculpt, but not a bad looking figure. I like how he's got gigantic wings that are as tall as his entire body. Unicorn: The least monstrous creature of the set. Like the centaur, a pretty standard interpretation. This one was also sculpted in a way that makes it appear sort of 2D. I'd imagine this was to make production of the figures simpler. Minotaur: I don't know exactly why, but for some reason I find this minotaur a bit goofy-looking. And I kinda love it for that. His body just looks so normal and non-beastlike, but then he's got the huge bull head. I think this one is my second favorite of the set. Medusa/Gorgon: Medusa was always one of my favorite monsters. I remember that as soon as I saw her on the Monster in My Pocket series one checklist after I got my first four pack as a kid, I tried to track her down in one of the 12-packs and was so excited when I finally did. It could have had something to do with the fact that the prototype they showed on the checklist was packing some major cleavage. Or maybe just because she's a cool monster. In any case, I might just be biased toward the character, but this is my clear favorite of the Diener Mythological Creatures set. I like the way they sculpted her head full of snakes, as well as her wretched, sort of dumbfounded expression. Dragon: I don't know whether this is supposed to be a specific monster or just a generic dragon. I am guessing just a generic dragon. In keeping with the rest of these figures it's a pretty simple and straightforward, but still a cool little sculpt. 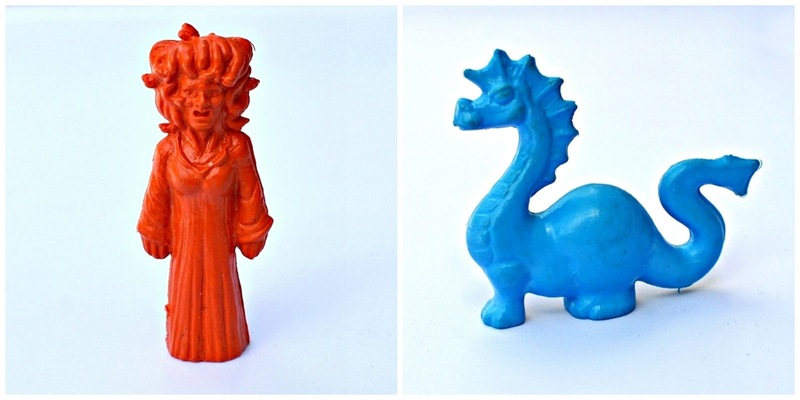 While the Diener Mythological Creatures might not be as iconic to collectors as the Space Creatures, it's a fun set that would be worthwhile to many mini figure and monster toy collectors. They were produced in a couple different materials: firmer plastic, like the versions shown above, as well as a softer eraser-like texture. There seems to be an ongoing demand for these types of Diener toys, but they appear frequently in eBay lots so it shouldn't be all that difficult for anyone to put a set together. Hah nice I had the unicorn in blue - maybe it's still around somewhere. Gotta love the Dieners. Seems like everyone who collects minifigures has at least a few lying around.